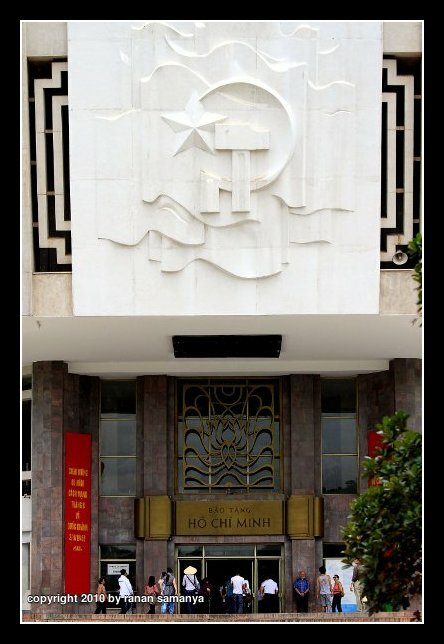 Entrance to Ho Chi Minh Museum in Hanoi. Canon EOS 7D, Canon EOS 24-105 f/4.0L IS @70mm, f/4.0, 1/1250sec, ISO 400. 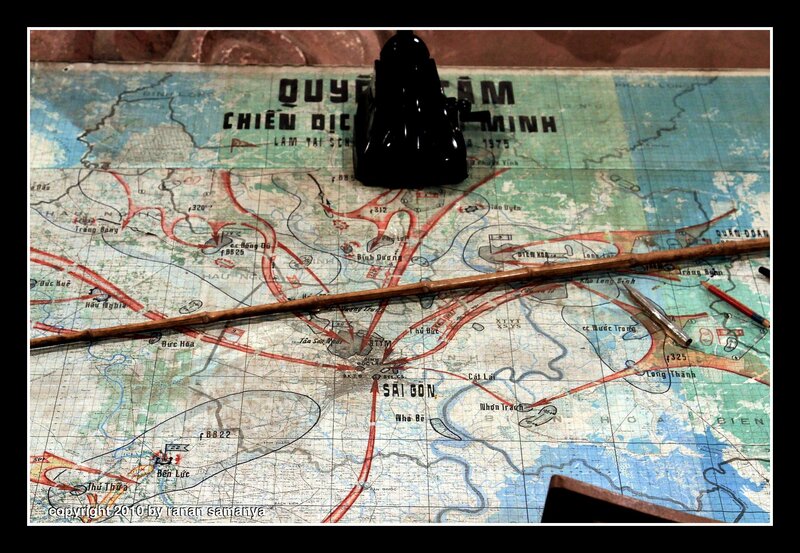 We started our Vietnam journey from the South, but to be able to understand Uncle Ho, his works, vision, and ideology it is best to go up north to Ho Chi Minh museum in Ha Noi. Built in 5 years with USSR aid, it was opened in 1990 to commemorate the 100 years birthday of him. 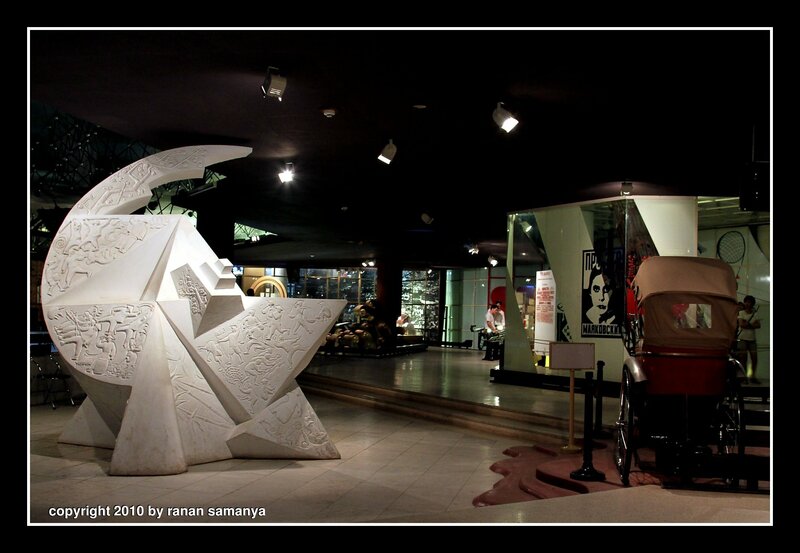 The museum covered a huge 10,000 m² area, and are divided into several themes according to his life. The main showroom exhibits more than 2,000 documents, articles and pictures with very artistic display which I assume depict the fine art of Soviet Union. 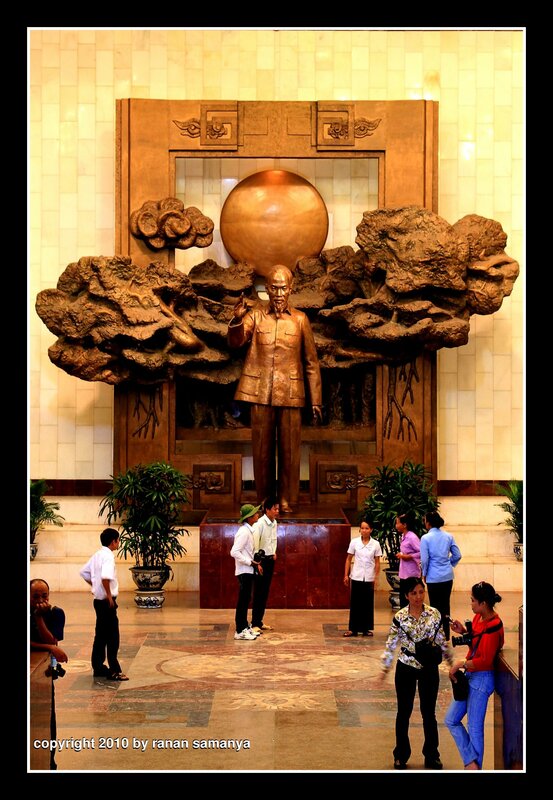 Ho Chi Minh statue greets everybody into the museum. Canon EOS 7D, Canon EOS 24-105 f/4.0L IS @47mm, f/5.6, 1/6sec, ISO 800. After a tight security check (where we will need to leave all bags behind – I even had to leave my camera back- and go though metal detectors) we will be greeting by Ho Chi Minh statue in the main assembly hall. 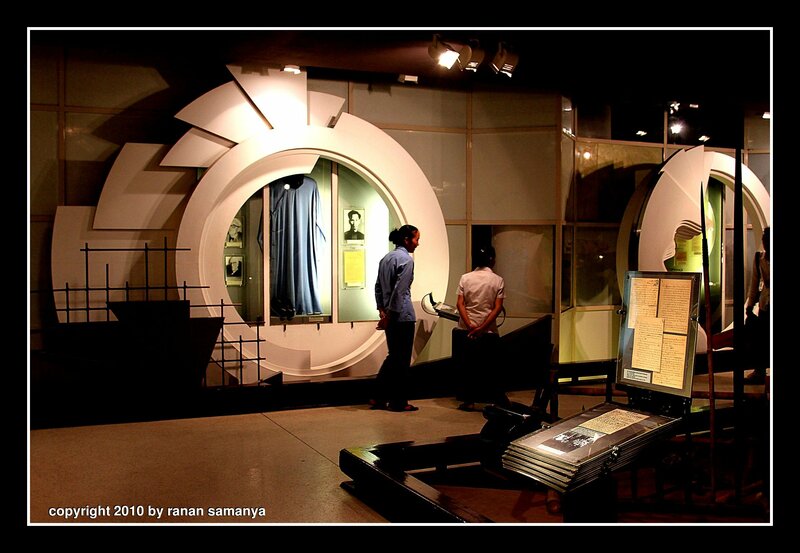 From here the first room is filled with early historical moments behind glasses. It is beyond this point that art started to dominate. 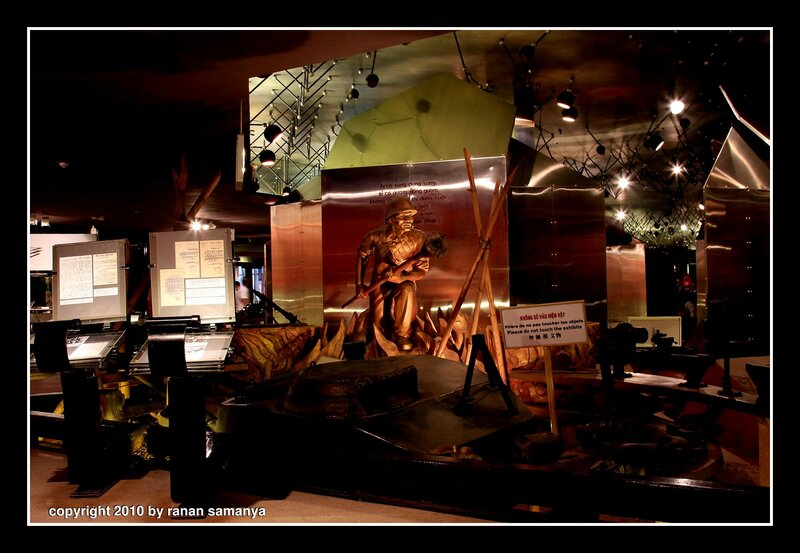 The inclusion of art into the exhibits (and the clever lighting) make the museum warm yet calm when displaying the war memorabilia. Canon EOS 7D, Canon EOS 24-105 f/4.0L IS @24mm, f/4.5, 1/40sec, ISO 800. Canon EOS 7D, Canon EOS 24-105 f/4.0L IS @24mm, f/5.6, 1/20sec, ISO 800. Vietnam war era. Canon EOS 7D, Canon EOS 24-105 f/4.0L IS @24mm, f/6.3, 1/4sec, ISO 640. "Friendship and peace among the world people". Autograph from January 1954. Below it, a photo when Ho Chi Minh signed a declaration in the Conference of the Representatives from the Communist and Workers parties in Moscow, January 1960. Canon EOS 7D, Canon EOS 24-105 f/4.0L IS @24mm, f/6.3, 1/8sec, ISO 640. The 1975 campaign that ended 20 years of war. Canon EOS 7D, Canon EOS 24-105 f/4.0L IS @55mm, f/6.3, 1/10sec, ISO 640. 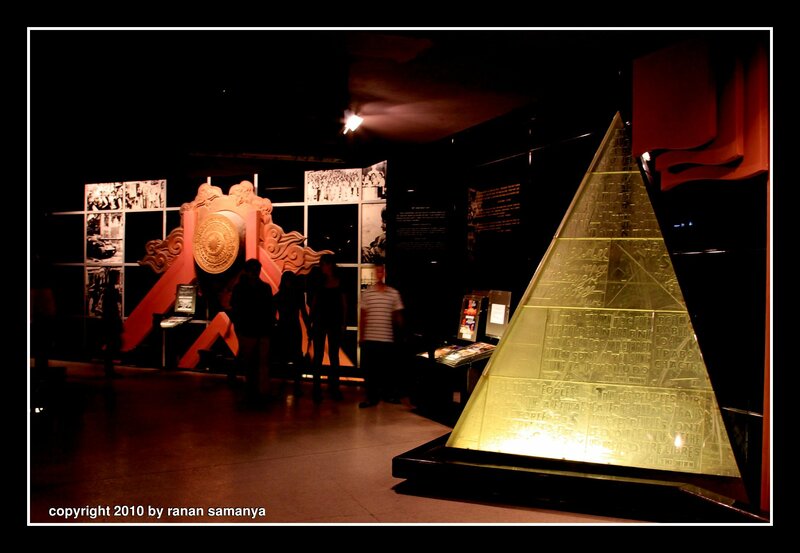 A pyramid of glass with one of Ho Chi minh's quote in many languages. Canon EOS 7D, Canon EOS 24-105 f/4.0L IS @24mm, f/8.0, 1/4sec, ISO 800. 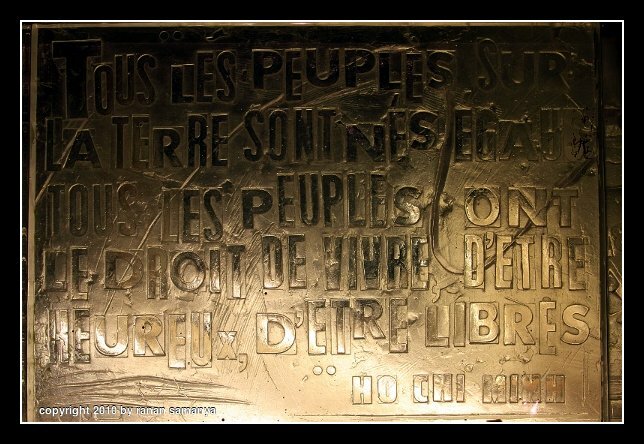 "All the peoples on earth are equal, each people has the right to life happines and liberty". Canon EOS 7D, Canon EOS 24-105 f/4.0L IS @28mm, f/8.0, 1/50sec, ISO 800. At the end of the exhibits we can enter a small hall to watch video of the development Vietnam has gone so far from three different LCD TVs side by side simultaneously. I would usually skip museums when visiting countries, but this is one museum that is much well worth visiting. 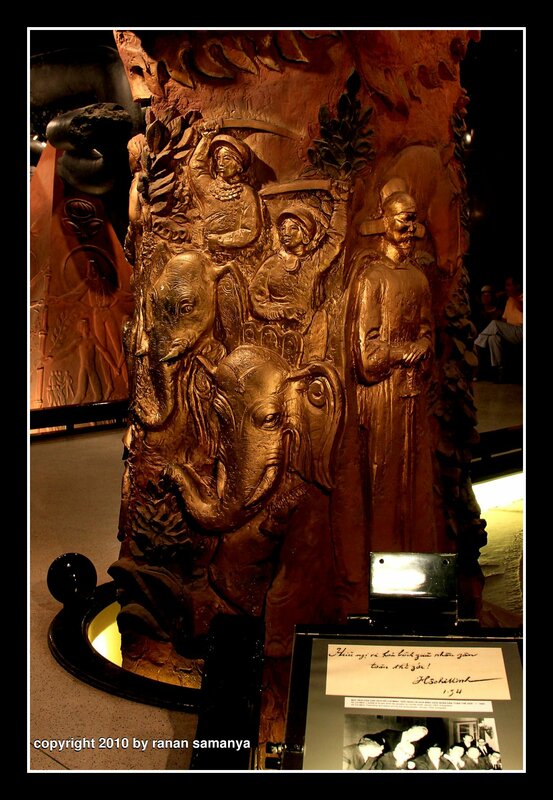 I would hope to come again one day and learn more…. They help you increasing the amount of your traffic to your website. They offer the best SEO services at affordable prices. place to call home. In the past virtual telephone services were provided by a business center which would offer an answering and messaging service.